The spritely flavor and melting juiciness of a tree-ripened plum is a pleasure grocery store fruit will never match. But if you have a plum tree in your yard you also know that the fruit ripens all at once. How can you hope to capture that bounty without waste? The answer lies in having a variety of preservation methods at your fingertips and being prepared to employ them at the drop of a…plum! Because ripe plums wait for no man. One of the most tried-and-true methods of preserving the plum bounty is also the most low-tech: dehydration. Pick plums in the morning while the air is still cool. The residual coolness of the fruit will postpone spoilage, giving you a bit of extra time to deal with them. Fruit should be firm, with some give when squeezed. Pick plums carefully, gently, into a container – a box placed in the shade works well. Line the bottom with paper grocery bags or an old clean towel to cushion them against bruising. Fruit boxes from the grocery store often come with a cardboard cushion similar to an egg carton, don’t throw it out – use it! If you pick up windfall plums, fruit that has already fallen to the ground, be sure to place these in a separate container and be ready to use them immediately as the fruit are surely bruised and will not last longer than tomorrow. It is best to fill the box no more than half full to prevent the weight of the fruit from crushing those beneath. I like to set up a comfortable work station for handling plums. When doing a task as repetitive as cutting up many pounds of fruit, it makes sense to conserve your energy with an organized approach. A large cutting board with a groove around the edge helps to catch juices. A small, sharp serrated knife, a tea spoon from our table service, a grapefruit spoon if the fruit clings to the pit, a large bowl for cut up fruit, a smaller bowl for pits, stems, and trimmings and a wash cloth for sticky fingers. My Dad taught me “assembly line” thinking, so I arrange my work station with natural progression of movement in mind, working from left to right. And I always keep a glass of water handy for sipping. Wash plums and cut in pieces that will fit comfortably on your dehydrator trays, keeping in mind how much clearance room is between trays. Space them a bit apart for good air circulation and to promote quick, even drying. Set the thermostat for 135°F, close the dehydrator and dry for 8-16 hours. Drying time depends on the size of the fruit pieces, how closely they are spaced on the trays, type of dehydrator, and weather. After 8 hours, test a few pieces of fruit from several trays for doneness by loosening them from the trays and squeezing them. They should be flexible with no pockets of squishy moisture in them. With practice your fingers will quickly be able to judge doneness. Remove the done pieces to a bowl to cool and allow the remaining to continue drying. Cooled fruit can be placed in an airtight, food grade container like a jar for storage. Don’t expect the all the fruit to be ready at the same time. 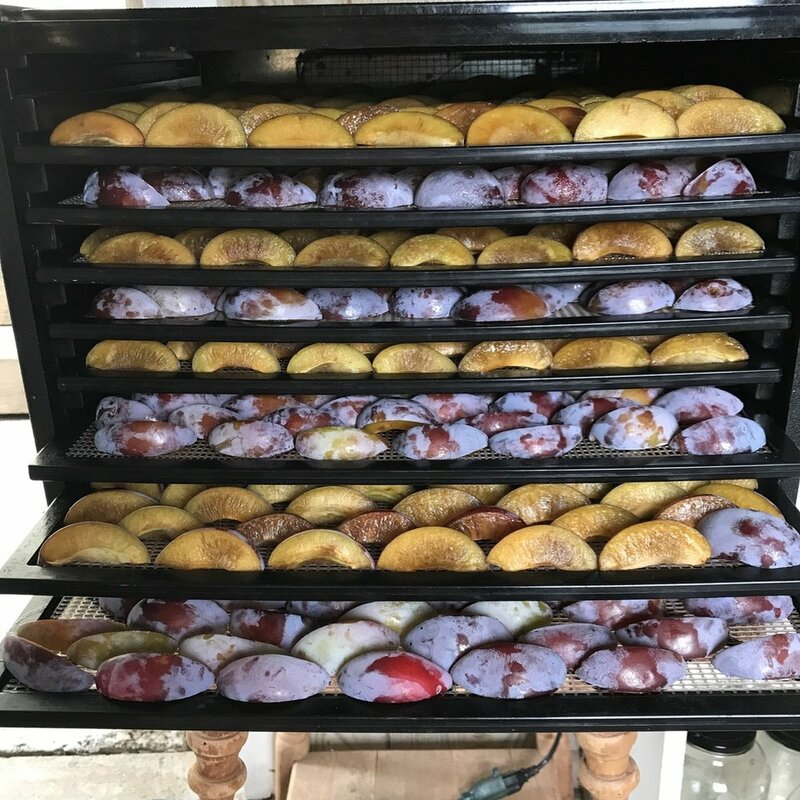 It helps to rearrange the trays, swapping the top and bottom trays with the middle and turning them around 180 degrees partway through drying. Don’t let your dehydrator sit turned off with fruit in it! This is one of the reasons I am not adamant about having a timer on my dehydrator. A turned off dehydrator full of dried fruit is an invitation to insects to begin nibbling and laying eggs. If the dehydrator sat without running for any length of time, you can prevent insect eggs from hatching and devouring your fruit by freezing the dried fruit in a container for several days. After a few days, you can move the container to the fridge or a dark, cool cupboard for long-term storage.